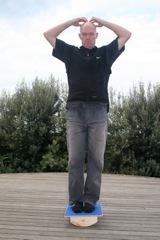 Why include Balance Training in your exercise approach? The mainstream exercise approach has a focus on activation of individual muscles or muscle groups. It is believed that by activating muscles, that the new motor pattern will be developed automatically. There is an assumption that all that is required is to strengthen muscle groups using progressive resistance exercise programs. The next evolution in thinking about exercise and movement realized that movement is interdependent with the coordination of the afferent pathways (information from receptors in the body) and the centres within the brain responsible for cognizing movement. The afferent system not only informs the brain, but has a substantial role in motor programming and motor system organisation. Muscle spindles (receptors located in muscle fibres) are well positioned to integrate the various signals from the brain and other peripheral sensory receptors to provide the necessary and situationally appropriate muscle tone for the desired movement. This contributes considerably to the attainment of well coordinated movement. From this understanding we come to appreciate that the role of proprioceptive stimulation is essential. From the evidence of neural science, it appears that motor learning involves plasticity of neural connections, neural membranes, and transmitter storage and release throughout the nervous system. The training science challenge is to find ways to facilitate what is optimal to elicit adaptation on a continuous basis. Therefore the way we approach training and exercise needs to honour the unity of the afferent system with the central regulatory nervous system and embodied attention to the task. Sensory Motor Stimulation (SMS) was devised by the Prague School, primarily by Professor Janda, and the work of their clinic has shown the importance of achieving quality movement patterns in motor re-education. This is because the information coming from the periphery is informing the motor program. One of the key premises of SMS is that in order to prevent injury, fast reflex muscle contraction is required to protect the joints. It is possible to accelerate by increased proprioceptive flow and balance exercises the quality of response in muscle contraction by two fold. Your efforts are directed at stimulating the proprioceptive system and the pathways responsible for regulating posture and equilibrium. The term I use for this type of focus is embodied attention. We learn to pay attention to sensation and feeling arising in the body and become familiar with key support zones that inform perception of vertical. The main tools used in SMS are rockerboards, wobble boards, swissballs and mini-tramps. SMS is useful as an exercise approach because it improves coordination, motor programming and the speed of activation of a muscle. Chronic back pain problems respond well using this approach because of improved control of trunk muscle firing, improved activation of gluteals and thus better stability of the pelvis is achieved. People who are advancing in age should consider this approach because it is gentle and can help to compensate for proprioceptive decline. Balance deficits have been correlated with an increased incidence of falls, and balance training has been shown to be an effective preventative intervention. We learn to pay attention to 3 points of support at the feet. We learn to feel the level of the hips and pelvic floor energetically and with diaphragmatic awareness of breathing. We stabilise the pelvis horizontally by directing pubic symphysis to the horizon and sacrum to the heels. We verticalise the ribs by bringing front ribs down on an out-breath. You’ll know you’re doing this correctly if your spine actually lengthens. The neck is free of tension and the sense of head balance is that the head is forward (beginning of a nod) and up (lengthening in gravity). When moving attention is directed to mid-line axis of rotation and weight-bearing support zones. Try the following exercise, which is a description of the sagittal plane squat above. 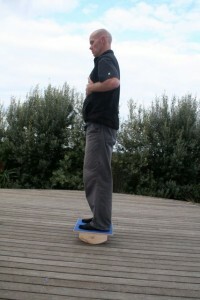 Stand on the rockerboard with the feet hip-width apart and the arches of the feet running through the centre of the board. Send the shins forward, knees forward and away and track the angle of shins and trunk with a long spine. Follow this down, stopping at any barriers and breathing. It is very important to be aware of every millimeter of how you are lowering the body by feeling the feet and keeping the sides of the trunk long. Follow the movement down to the limit of your symmetry and hold the bottom position and breathe. Over time, this bottom position will improve, with this comes the improvement in your function. Rockerboard bi-lateral stance in 3 planes of movement. 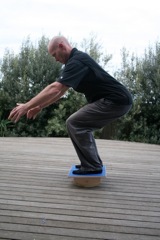 Rockerboard squat in 3 planes of movement. Balance training automates optimal motor learning if one is able to attend to embodied information arising in the body while performing the functional tasks. Our uprightness and stability cannot be assumed and we learn to attend to important information in stance and gait. The emphasis is on optimal posture and axial extension of the spine to influence recruitment and motor organisation.